When having track cut, choose Cut Track Shipping in the Shipping Methods at check out. Maximum cut must be less than 105 inches. ready for hospitality, commercial and residential use. Custom Expressions smooth or reeded wood poles 1 3/8"
poles over 100 inches will have to be shipped by truck. Custom made product, please allow 15 working days for completion. 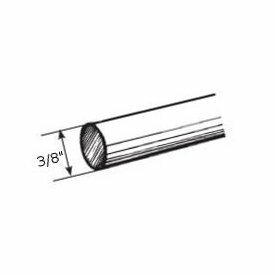 Flat endnd cap for 1 1/2 inch diameter indoor or outdoor curtain rod. inside on any window. Charleston collection by Design Elements. be shipped by truck which is not covered with the free shipping policy. six new colors. Sizes to fit windows from 38 inches to 270 inches wide. Graber drapery rods, bright brass finish, includes mounting hardware. Clearance 2 1/2 to 3 1/2". Adjustable end brackets are hidden style . is available to add 2" to the rod projection. Weight limit: 1 1/2 lbs per foot up to 84", 1 lb per foot over 84"
1-423-8: Decorative traverse rods 66-120" two-way draw 1 1/2"
rods for any window. Renaissance Collection by Design Elements. Availability: Ships in 1 to 3 business days (In-stock), 5 business days (Custom) Priced each. finials are plastic. Priced each. to accommodate your drapery design.